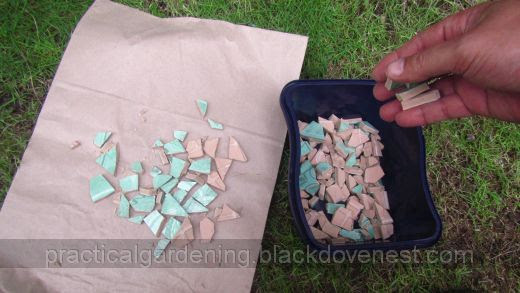 The smaller the size of the broken pieces, the more number of pieces you will be gluing to the garden clay pot. 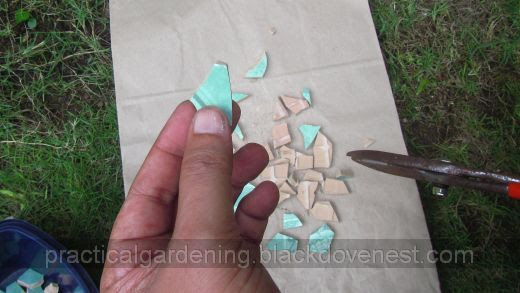 But the bigger the size of the piece, the more uneven the mosaic surface will become. 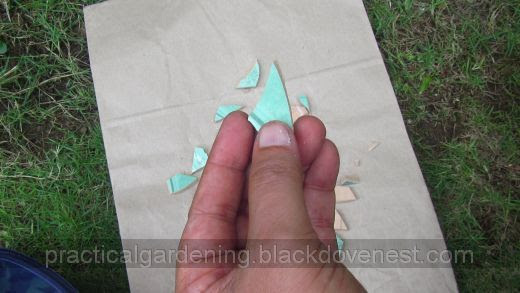 Some of the smaller broken pieces may have very sharp or pointed corners. 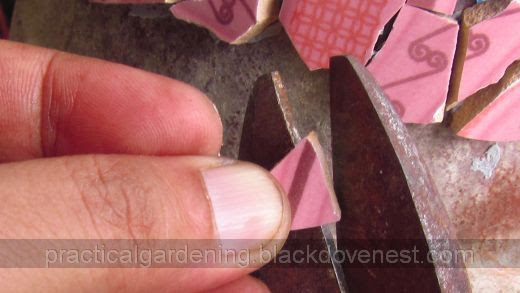 Use a pair of heavy tinsnips or a tile cutter to cut off and remove these pointed corners. 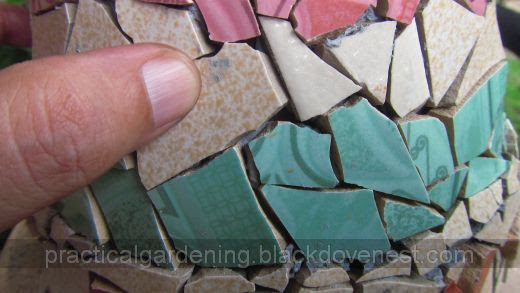 Tile pieces that are less pointed are easier to position on a mosaic pattern and are safer to handle. Collect all broken tile pieces in a plastic bin. 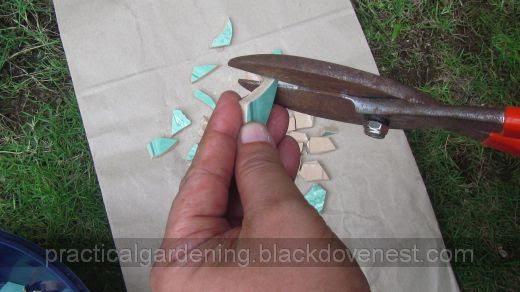 Picking and working with the broken tiles would be more convenient this way. Be sure to sort and segregate tile colors into separate plastic bins. 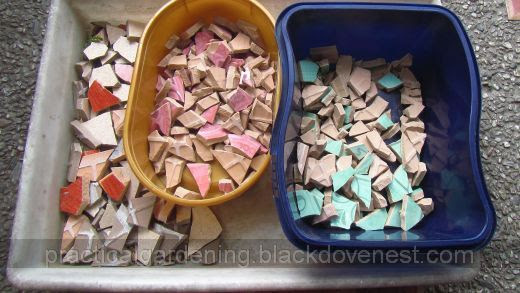 Retrieval is easy and this keeps the tile pieces organized and tidy. Before even starting, have a mosaic design ready. For this project, a simple horizontal layer pattern was used. It is a a design that's relatively easy to execute. 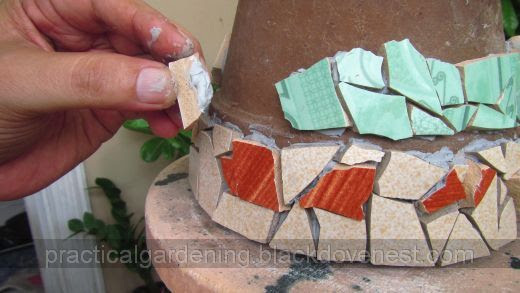 You simply add tile pieces of a single around the pot. In the next horizontal layer, you add pieces of another color, and so on. Do consider the available tile colors and the available number of tiles per color. This way, when you have a set mosaic pattern in mind, you don't run out of tile pieces. With a caulking gun, push sealant into a plastic lid as shown. 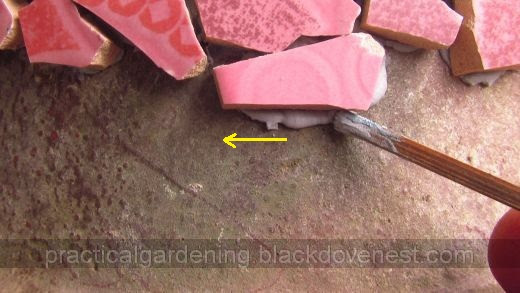 With a spatula or stick, dab a little sealant at the back of a tile piece. 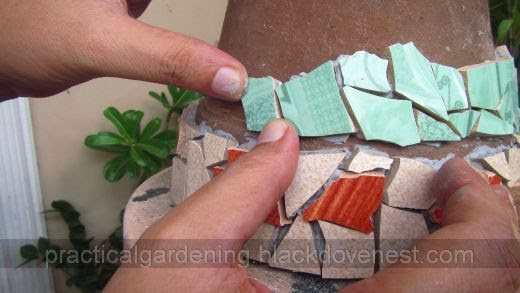 Position the tile piece in an appropriate spot on the garden pot. Secure the tile piece by pressing it on the pot with both thumbs for three seconds. Make sure it sticks and doesn't slide or fall off when released. 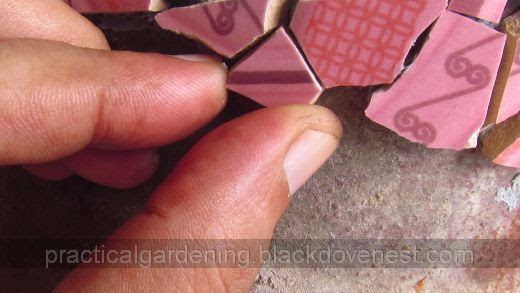 If some tile pieces won't fit because of thick edges, you could shave off some of the thick clay material of the tile piece. Use a pair of heavy-duty tinsnips to cut off the material as shown below. Then you could easily position the piece into a corner. 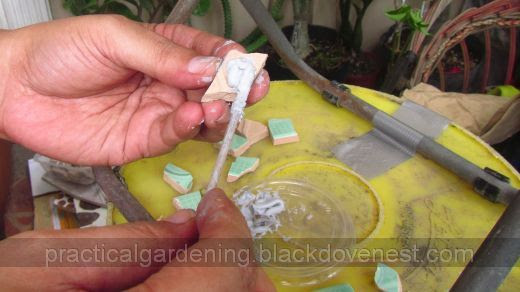 Remove excess sealant from the tile pieces by pushing this with the stick or spatula. Unless it has dried and hardened, this excess sealant may be reused. 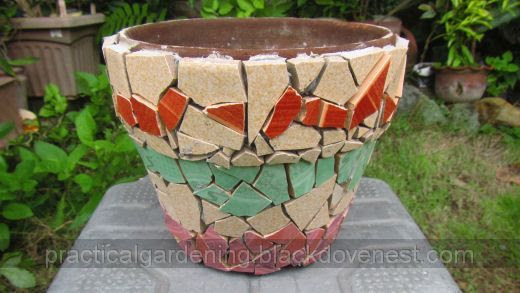 Shown below is the clay garden pot with all the tile pieces affixed. Notice the bottom edge of the clay pot was not filled with small tile pieces. Grout will be added here instead to keep the bottom edge smooth and even. Some of the pieces may have a little sealant stuck on the surface. The sealant may easily be removed by scratching with your finger nail. A thin spatula or flat screwdriver can also be used for this purpose. 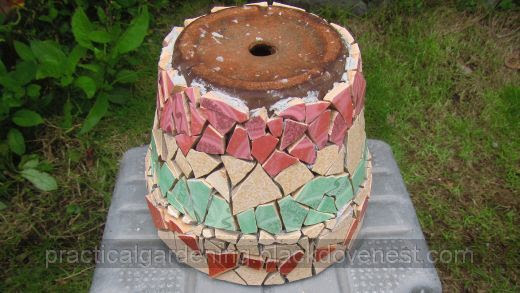 Here's the completed clay garden pot set upright. Notice the top rim of the clay pot. The tile pieces were set in such a way that their tops are flatter and level all around. 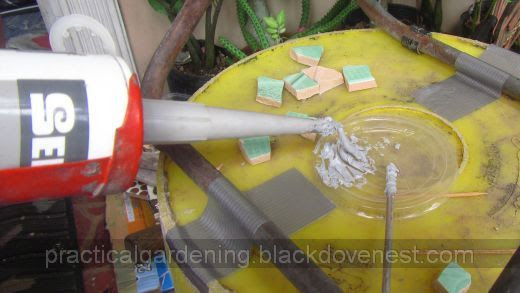 When the grout is applied at this top of the rim, the result will be smoother and more even.